There Are Exceptions To The Rules! Sure foundations are built are on blueprints and rules, but sometimes there are The Exceptions To The Rules– makem don’t breakem! E. Michelle Lee; a woman of strength and resilience shows you how to overcome ANY obstacle with a smile! (Columbus, OHIO) – Just about everybody in today’s world can be an Exception to their current, past, or future circumstances; if they want too. We are all singing in the same choir of difficulty, hardship, and pain. How we overcome each new challenge shows us who we are and who we want to become, no matter how hard, we have to try over and over again. Why? Because we are The Exceptions To The Rules! “The Exceptions To The Rules- Are you one? You Can BE” How to overcome ANY obstacle; By: E. Michelle Lee is a very inspiring book about persistence, resilience, and getting the resources you need when budgets are tight. It is a book for those who have had to pick themselves up by the bootstraps more than once and for those who have never experienced such hardship as in today’s world. It is the story of a person who refuses to give up even when all odds are stacked against her. Let this book act as your guide to overcoming obstacles, hurdles, and challenges in everyday life to get you going again. Be inspired. Be an Exception To The Rule. You will find a ton of resources, links, quips, quotes, personal stories of triumph and defeat, the 3Deep Method, and much more to help you get what you need in “Real Time” and “At the speed of business” to overcome anything that you face with courage, strength, and dignity! The book is for anyone; male or female, who knows deep down inside that their success measuring stick is not to the Jones’ but to their own beat and mission coupled with their passion. You will not believe what you can absorb for your own good by looking at someone else’s experiences before you have to just jump right in blindly. E. Michelle Lee has researched 400 subject matters that she shares a few of in this book. Get ready to roll up your sleeves, put on some thick skin, and have some fun while getting the motivation and resources you need to overcome any hurdle or challenge life presents to you. Turn those hurdles into stepping blocks with every turn of the page. About the author: Ms. E. Michelle Lee, Speaker- Business Consultant, Executive Producer, and Publicist, owner of PR With A Purpose located in Ohio with an international reach. The encourager, motivator, and supporter of those elite people who are exceptions to the rules and who have exhibited the makings of Give Back 2 Pay Forward into their hearts first and business second. Michelle has overcome and shared her knowledge with others of over 400 human needs and business subjects that she provides solutions for to individuals and businesses with truthful advice; while being entertaining and with a light-hearted approach for strategic and creative solutions. Her approach; 3Deep Formula (3X3X3=?) is humorous and resource-rich. Her mission is to help all people get the resources they need to succeed in “real time” and “at the speed of business”. 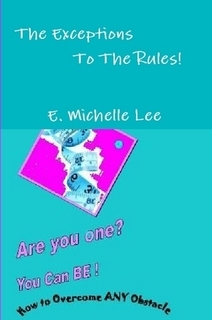 Learn more at http://www.lulu.com/shop/e-michelle-lee/the-exceptions-to-the-rules-are-you-one-you-can-be-how-to-overcome-any-obstacle/paperback/product-20143173.html . I’m amazed, I must say. Seldom do I encounter a blog that’s equally educative and entertaining, and let me tell you, you have hit the nail on the head. The issue is something that too few men and women are speaking intelligently about. Now i’m very happy that I stumbled across this in my hunt for something concerning this. Greetings from Ohio! I’m bored at work so I decided to check out your website on my iphone during lunch break. I enjoy the info you present here and can’t wait to take a look when I get home. I’m amazed at how quick your blog loaded on my phone .. I’m not even using WIFI, just 3G .. Anyhow, great blog! Hmm it looks like your blog ate my first comment (it was extremely long) so I guess I’ll just sum it up what I had written and say, I’m thoroughly enjoying your blog. I too am an aspiring blog writer but I’m still new to everything. Do you have any suggestions for rookie blog writers? I’d certainly appreciate it. Fantastic blog! Do you have any recommendations for aspiring writers? I’m hoping to start my own site soon but I’m a little lost on everything. Would you suggest starting with a free platform like WordPress or go for a paid option? There are so many choices out there that I’m totally confused .. Any suggestions? Cheers! you’ve a terrific blog right here! would you like to make some invite posts on my blog? Thank Ya so much Lubbock TX, appreciate ya stopping by and leaving a comment. Do feel free to drop in anytime. Hey Deandre Agustin, thanks so much for stopping by. Glad to hear you enjoyed my site. If you think the site is good. You should listen to my LIVE radio show on talktainmentradio.com LIVE today at 6PM EST. Hope to hear from you again real soon. You can always call into the show at 877-932-9766. Hi there! Someone in my Myspace group shared this site with us so I came to look it over. I’m definitely loving the information. I’m bookmarking and will be tweeting this to my followers! Exceptional blog and terrific style and design.